Smoothies – Are they really a health risk? If you’re the type of person who frequently finds themselves standing in front of an open fridge or cupboard door, searching for something to nibble on, even if you’re not particularly hungry, then it’s possible you’re a mindless eater. And mindless eaters can have a tendency to gain weight. Alternatively, if you’re someone who likes snacking between meals but ends up eating too many calories overall, then it’s worthwhile looking for lower calorie, satisfying snacks that won’t be finished in a couple of bites. I recently discovered these little wonder snacks which are super healthy. They’re high in fibre, so they’re filling and help you stay fuller longer, plus they’re a good source of protein, low in fat, sugar and salt with just 88 calories per pack. The trouble with so many lower calorie snacks is that they’re often only low in calories because the pack’s so small. Low fat crisps for example, often have just six or seven crisps per pack. After a couple of minutes they’re gone and you can be left feeling cheated, not satisfied and still wanting to eat more. 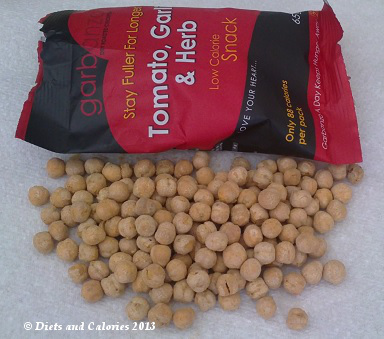 Garbanzo’s dry roasted chickpeas certainly don’t leave you hungry. Each 65g pack contains a small mountain of chickpeas that take ages to get through. 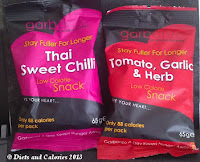 I purchased two varieties in a branch of Holland and Barrett: Tomato, Garlic & Herb and Thai Sweet Chilli. There’s also another variety called Bombay Fire Cracker which I imagine is somewhat hot! All packs weigh 65g and contain 88 calories. I poured out half a pack into a small bowl to munch on while working away at my laptop. It took me about half an hour of alternately snacking on a few, then working before finishing them. By then I’d had enough to satisfy any hunger, as well as quelling any further desire to keep on munching. They also left me quite thirsty as they are ‘dry’. Of course, drinking after eating a high fibre snack like this is a good idea as the liquid will help fill you even more. I can’t say I particularly like the taste of the chickpeas, but the spices that cover these snacks go someway towards disguising their taste. One thing to watch out for is their ‘crunch’ factor. They are quite hard to bite. The odd one or two are like rocks, so if you have any dodgy fillings (like me) or weak teeth, just be careful! They’re not that cheap at £1.25 per bag (at the time of writing), but they do go a long way and you get a lot for your money for very few calories. I purchased mine from a branch of Holland & Barrett. Nutrition Information per 65g pack: 88 calories, 6.6g protein, 15.5g carbs, 0.5g sugars, 1.3g fat, 0.3g saturates, 4.8g fibre, trace salt. Suitable for vegetarians. These are absolutely gorgeous, but the Bombay Firecracker is a big anticlimax. Definitely not the ferocious explosion of flavour you expect. To be fair I could have just gotten a poor bag so I'd definitely give them a shot.